It’s been almost a year since we’ve filed for the 485 and everyone who’s filed around us has gotten an interview scheduled already. We’ve tried calling but you can no longer speak to a real person and Orlando has abandon the immigrants here by no longer accepting infopass appointments. 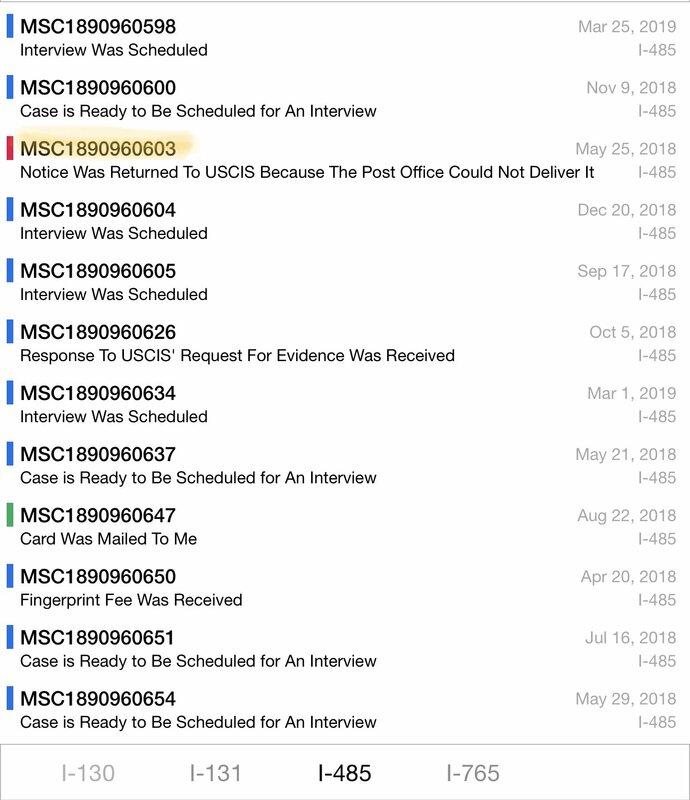 There’s been no update online we’ve called numerous times when you could still speak with an agent and they told us everything was fine even though the status online still says “Notice was returned to USCIS because the Post Office could not deliver it.” I received an email that an action was taken October 11 2018 but no one can tell me what that action was, it’s not reflected on the computer and we received no notice. My husband still has no EAD card even though he did his biometrics all the way back in July. We literally don’t even know what to do anymore since USCIS has abandon us. I included a photo just in case you think I’m exaggerating. Did you move during the process? Changed mailing address? 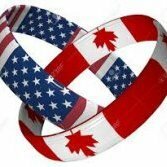 you can no longer speak to a real person and Orlando has abandon the immigrants here by no longer accepting infopass appointments. Many of the field offices across different States have stopped applicants from scheduling their own infopass appointments using the online system (in part due to resources being clogged up by those who didn't really have a need for an appointment---ie. those taking an appointment slot away from someone in need to ask "what form should I fill out/what evidence should I submit" and things like that which can easily be found out through their website/form instructions). 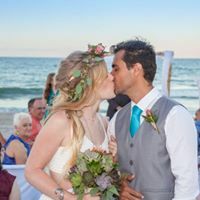 Applicants still obtain an infopass appointment under certain circumstances, however they now need to request it over the phone with USCIS's customer service line. If they determine an appointment is necessary they will help schedule one. Another alternative is to ask to be transferred to a L2 officer who can look into your actual case details and give more pointed information (if you haven't already), instead of speaking only to the L1 agents who initially answer the phone. What is this horrible app you're using? Why are the dates out of order and why so many different MSC numbers? Except you can no longer speak to a real person at all when you call. 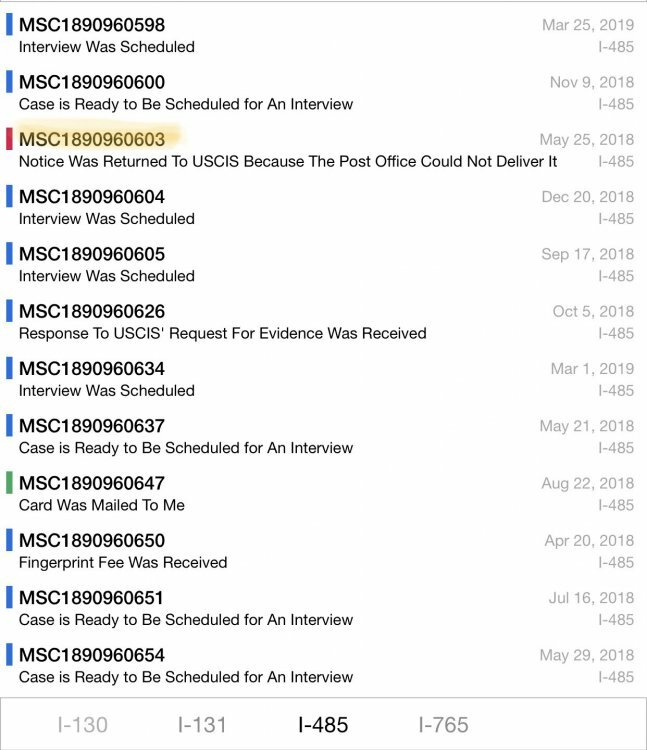 It’s USCIS’s case tracker the dates are out of order because those are the dates they were last updated. Those MSC numbers are all the ones in order filed around my husbands, my husbands being the one in yellow. That makes way more sense. I didn't know that existed. You've spoken with a tier 2 rep I assume? This could be a USPS issue. I've been paranoid about our mailbox in the beginning, because I've read that some mail delivery personnel won't deliver government documents if they're "not sure" the person lives there for some weird reason, so I've seen recommendations that people add their names to the mailbox. Maybe you have a crappy delivery person. You've said it's only been a year, which is still within processing times. Processing times for Orlando is 13-19.5 months. Receipt date for case inquiry for Orlando is August 29, 2017. According to your timeline your NOA date is April 23, 2018. You've still got several months before a case inquiry is warranted. Otherwise, you are just using USCIS resources that could be spent adjudicating cases that were in line before you. As for your EAD and AP, you should have received that. Contact your representatives.